The MCL (medial collateral ligament) and LCL (lateral collateral ligament) are located at the medial (inner) and lateral (outer) aspects of the knee, respectively. These ligaments work with the ACL and PCL to keep the knee stable during motion and activity. Injuries to the MCL often arise from a severe lateral blow to the knee. Severe tears of the MCL are often associated with damage to the medial meniscus. Damage to the LCL often results from forceful collisions on the medial side of the knee. Conservative measures of rest, physical therapy and anti-inflammatory medications should be attempted prior to considering surgery. The PCL (posterior cruciate ligament) is an additional stabilizer of the knee joint, preventing the tibia from sliding posterior in reference to the femur. Injury to the PCL is less common and more difficult to evaluate than other ligament injuries. PCL injuries often occur in combination with damage to other ligaments and cartilage of the knee. Generally, PCL injuries are treated non-operatively, with rest, ice, elevation and anti-inflammatories. 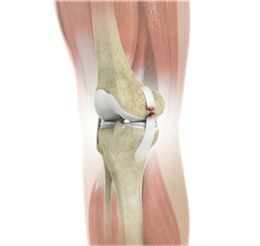 Surgery may be recommended if the patient has a combined injury rendering the knee unstable. Severe damage to one or more ligaments, especially those combined with cartilage damage, may require surgery. Conservative measures of rest, physical therapy, bracing and anti-inflammatory medications should be attempted prior to considering surgery. An MRI of the injured knee can assist in diagnosing ligament tears and damage to other soft tissues of the joint. An arthroscopic technique is commonly used to repair or replace torn ligaments of the knee. Arthroscopic knee surgery incorporates the use of small poke-hole incisions (portals) around the joint, and the use of a specialized camera (arthroscope) among other specified arthroscopic surgical instruments. The goal of arthroscopic surgery is to repair and restore the joint to optimal strength, while maintaining range of motion. Due to the minimally invasive nature of the arthroscopic technique, damage to surrounding muscles, ligaments, tendons, nerves and blood vessels is significantly reduced. Risk of infection, post-operative pain and rehabilitation are also decreased compared to the traditional open-technique. Certain ligament reconstructions involve restricted weight bearing and a postoperative brace ranging from 2-6 weeks. This will be different for each injury and each specific surgical intervention.